Fiber Rush KIT 5/32 Kraft Brown with instruction booklet by V.I. Reed & Cane, Inc. at The Artisan Lounge. MPN: 532FRKIT. Hurry! Limited time offer. Offer valid only while supplies last. Fiber Rush Kit includes one coil of 5/32 fiber rush with Fiber Rush Seat Weaving booklet. Color is Kraft Brown. Click on image to compare sizes. 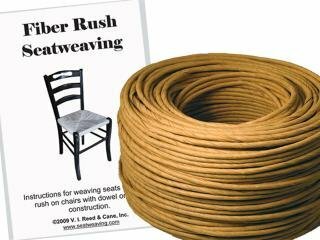 Fiber Rush Kit includes one coil of 5/32 fiber rush with Fiber Rush Seat Weaving booklet. Color is Kraft Brown. Click on image to compare sizes. Enough for a 14x14" chair seat. Size is 5/32". Quantity is 320'. V.I. Reed & Cane, Inc. is in its 35th year and 2nd generation as a veteran-owned family business. We are proud to sell our own high quality, Made in the USA basket and seat weaving kits as well as a wide range of other supplies. Manufacturer: V.I. Reed & Cane, Inc. Brand: V.I. Reed & Cane, Inc. Publisher: V.I. Reed & Cane, Inc. Studio: V.I. Reed & Cane, Inc. If you have any questions about this product by V.I. Reed & Cane, Inc., contact us by completing and submitting the form below. If you are looking for a specif part number, please include it with your message.